The Muskox is a unique looking mammal that can only be found in the Arctic Circle. It’s thick coat and thick build has adapted over thousands of years to acclimate to the Arctic’s harsh climate. By the look of them, you may assume they are related to the bison, but they are actually more closely related to the goat or the sheep. Their ancestors are thought to have come to North America from Eurasia through the Bering Land Bridge some 200,000 years ago. Rolf Steinmann, director of the beautiful film “In Between”, captured this ancient creature in their natural and frozen habitat. 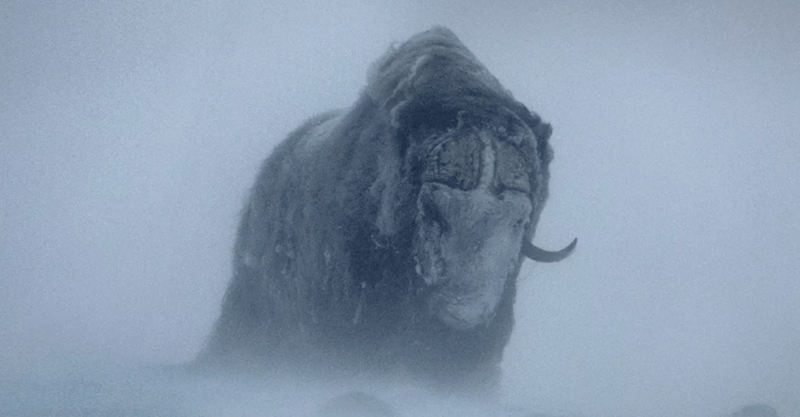 In the film he follows the mystical beasts through the frozen tundra, building the dramatic scenes with shots of frigid mountain ranges, blistering wind, and a desolate, frozen earth before unveiling the Muskoxen’s wooly stature and venerable beauty. “In Between” premiered internationally in Warsaw Film Festival in October and nabbed an audience award at the Greenscreen Festival earlier this year. See more of Steinmann’s incredible work on his website, Vimeo and Twitter.